At the head of an untouched valley some 200m above sea, 'Lugar pequeno' is located in a place of privilege in the small galician hamlet of Golmar. The house, perfectly equipped, is the summer home of its owners. It fusions tradition and family memories with a touch of modern style. All rooms and garden enjoy extensive impressive views over a green valley, forest, cliffs, sea and some 80Km of virgin Atlantic coast. Due to its unique location the house enjoys not just superb ocean views, but peaceful and clean views over the unspoiled valley as a natural extension of the garden. It receives sunlight from dawn to sunset. Located within a Natural area of the EU network "Natura 2000", you will enjoy complete tranquility, being only at 4 Km distance to the fishing town of Cedeira, with shops, all facilities, a nice beach and seaport, and very good tapas restaurants. You will enjoy some of the best sandy virgin beaches in Europe and outstanding hiking paths from the house through the forest, cliffs, the lighthouse.... Other activities, like surfing, horse riding or kayak are available in the area. Beaches: You can choose among beaches with extensive dunes and wonderful views (Vilarube), calm water (A Magdalena) or high waves (Pantin, Baleo) , birdwatching or kite-surfing(Frouxeira), etc. Sonreiro is the hidden cove beach closer to the house, near to 'Castillo de La Concepción' (the ancient fort protecting Cedeira´s harbor). End of August or September, “Pantin classic” is a well-known qualifying series of the world surfing championship. Last weekend of June local ranchers gather hundreds of wild horses living free in Capelada mountains (12Km away), in order to haircut their mains and tails, dworming horses, branding of foals born during springtime and buying and saling foals. A small fair and lunch accompanies these activities. Excursions : Other interesting spots to visit (within less than one-hour drive) are, driving East, Estaca de Bares Cape, Ortigueira, O Barqueiro and Viveiro and, towards West, the Natural Park Fragas do Eume, Pontedeume or St. Felipe casttle in Ferrol. The towns of A Coruña or Santiago de Compostela, are excellent options for a day excursion (at 75 and 90 min-drive). Santiago is a must, its medieval centre is UNESCO´s world heritage, with the impressive cathedral (tomb of the appostle St. James) has been pilgrimage destination for centuries. A Coruña, financial centre of Galicia and home of the biggest Spanish fashion firm, Zara, is a lively nice city with a wide range of cultural, gastronomic and shopping possibilities, as well as a very nice old medieval quarter and marina. Inland, Lugo (100 min. drive) is an ancient city surrounded by an impressive complete Roman wall (of some 2 Km). Its charming old centre includes a XII century cathedral, a baroque town hall and lovely squares and alleys. How to get to: Flights to the airports of Santiago de Compostela (SCQ) or La Coruna (LCG) are often available. The 1.15 hour or 1.30 hour drive from La Coruña or Santiago airports is a pleasure in itself. Being my husband and his family originally from this region, we have always enjoyed our summer holidays here. Although we currently live abroad, we come as often as we can. It is our private haven to escape from everyday hassles and fusses. A house thought for escaping, relaxing and entertaining our close friends and family, with all we need to feel comfortable and at home. The first time we visited Golmar, we inmediately felt the magic and beauty of the place and started to make plans. This was our personal project for a while, and we have moved here a good part of our family history to feel at home and relaxed. We have never looked back or regret our decision. The more we travel, the more we realise how valuable this place is. Simply, very difficult to find a better getaway: you have the views from EVERY room of the house, you have the unspoiled nature at your feet, you have the peace and the uniqueness of the place. We have enjoyed the most impressive sunsets from outside and inside the house. The house is also perfect for sharing because you have different living areas: porch and garden outdoors; a living room with two separated sitting areas, another separate TV room, a dining area indoors and a nice garden in two levels with a sun-bathing area and a dine "al fresco" area. Bathroom 1, in the corridor, provides service to bedrooms 2 and 3. The other 2 bathrooms are ensuit for bedrooms 1 and 4 respectively. The house, absolutely fully equipped, fusions tradition with modern style. Every single room enjoys clean views over the ocean. Wide common areas, built on three separate levels open to the stairs, include the big living room (with fireplace and two differentiated sitting spaces), a TV room, and the dining room, so you can comfortably share your life or split in different areas when you prefer more privacy. 4 bedrooms and 3 WC are perfect for up to 8 people. Wi-Fi, Hi-Fi and DVD-Blue Ray available. The library has a good collection of books. The porch is a wonderful place for al-fresco dining, enjoying views and sunsets. The two level garden allows to split also outdoor at your convenience. The bikes are a nice extra. We spent 3 days at this beautiful home... and of course, hated to leave. The house is absolutely amazing - stocked with everything you could possibly need for a comfortable and memorable stay, beautifully furnished, with breathtaking views of the sea and surrounding areas. The village/hamlet that the house is in is great for a quiet and relaxing getaway. The area around the house is great for hiking, photography, or just to take a walk within nature. Oh, and just when we thought it couldn't get any better, we saw wild horses! The town of Cedeira is a short drive from the house. There, you can find restaurants, bars, shopping and a grocery store (supermarket) with a wide selection of food items to purchase if you wish to cook at home (which we did for several meals). There were 6 of us (3 couples) from the UK. We spent 2 weeks in this very lovely house. The location was superb with views over the sea. The house was well appointed with all that you could possibly need for a great holiday. Everything worked as it ought to and provided a fabulous base from which we could explore the immediate and wider locality of Northern Spain. The local walking is excellent through eucalyptus forests; wider afield there are coastal pathways overlooking magnificent scenery. The local town provides everything would need with good supermarkets, fresh food shops and of course plenty of fresh fish of all descriptions. We visited one or two of the restaurants and found them very good indeed. The local tourism office is extremely helpful. We should definitely come back another time. We really enjoyed our fortnight stay at Lugar Pequeno, a wonderful house high in the hills above Cedeira. The views are magnificent and the afternoons and early evenings get lots of sunshine; all very quiet and peaceful. The property is well appointed and everything works! We brought our bikes with us and cycled every day - the roads are quiet and there are some great, though very hilly, rides in this part of Galicia. Stage 4 of the 2016 Vuelta came through Cedeira and finished above San Andres de Teixido, a sanctuary which is well worth a visit. Cedeira itself is a nice town, with lots of good cafes and restaurants. A Coruna is an hour or so away in the car and well worth a visit; we stayed there one night and then took the train to Santiago (30 minutes by train from A Coruna) for a short visit, an arrangement that worked well for us. So, five stars from us. The house is beautifully presented and very comfortable. We found that everything we needed for our stay was to hand. The views from the terrace across the garden to the ocean are magnificent. The location is peaceful but relatively accessible (car required, winding uphill road through forest). There are many beautiful beaches within a short drive, and the attractive town of Cedeira offers numerous cafes, bars and restaurants as well as shops, banks etc. Recommended. Grand three level very modern house. Well equipped. Lovely views down the valley to the sea below (house is about 600' up above) and wide ranging coastal vista to headlands in the distance. La casa es preciosa. El entorno es espectacular y muy tranquilo. Las vistas y las puestas de sol inolvidables. El equipamiento de la casa muy completo. Para repetir. Away from the mass tourism of other regions, the house is located in the Rias Altas area and Costa Artabra, an undiscovered coastal zone of unique natural beauty. Within minutes from wonderful sandy beaches, estuaries, lagoons and impressive cliffs. You will be within a natural area of 'Natura 2000', the EU's network of sites of interest due to their ecosystems and biodiversity. It is possible to see occasionally wild horses, foxes, wild boar or roe deer. From the house, you can walk to the valley, forest and cliffs, the lighthouse or the small church of St. Antonio. From the hamlet, you can take the footpath to the pilgrimage place of San Andrés, which leads to the zone with the highest cliffs in the western European continent (620m. above the sea level), and impressive cape Ortegal, of geological interest. 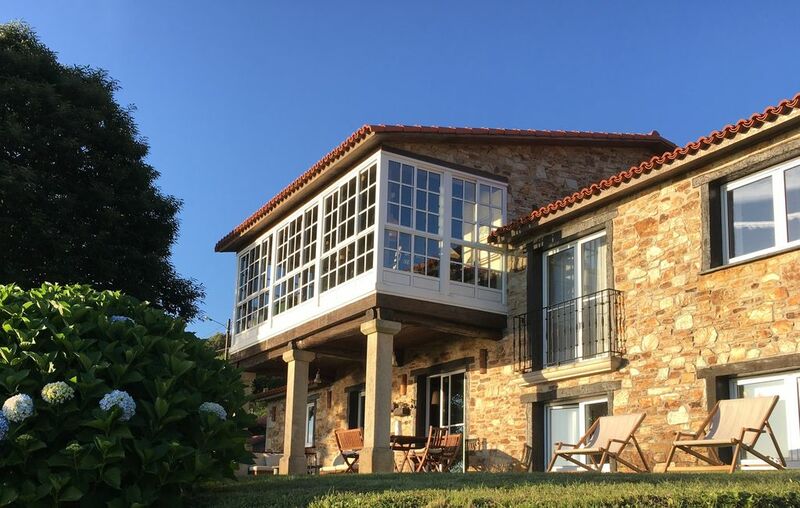 The house, at 4,5 Km from the fishing town of Cedeira with all facilities, shops and restaurants, is an excelent base for exploring the region of Galicia: natural parks, world heritage towns, like Santiago, and lively cities like A Coruña. Other activities: surfing, horse riding, kayak, etc.